On November 14, 2003, What The...? guitarist Lee Flier lost her beloved Siberian Husky, Kira, to a rare kidney disease. What The...? 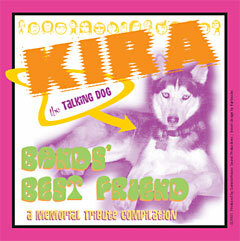 and many other Atlanta bands knew Kira well, as they rehearsed, recorded or jammed at parties at Lee's place, and all loved Kira's sweet nature and her ability to have "conversations" - rather than barking, she would make various talking and howling sounds, some of which have ended up on recordings. Kira was only 5 years old when she became ill, but she brought joy and fun into the lives of many. So Lee's friends in the Atlanta music scene rallied to help her out and to remember Kira in the best way they know how - playing music! On December 12, 2003, a benefit/memorial show for Kira was held at the Village in East Atlanta, which featured 8 local bands. It was a wonderful time (photo gallery coming soon)! In addition, the participating bands and a few others put together a compilation CD which was sold at the show. Only 100 of them were made, but you can buy them right here while they last! This is truly a one of a kind effort, with many tracks you won't hear anywhere else, and all proceeds will go toward vet bills incurred during Kira's illness. Our special thanks to all who played at the benefit show!